From Here to Infinity....and back !!! Infinity Systems is a company which started out from literally a garage, yet just several years after its inception, already managed to become a legend. The elder among us will remember their speakers, their EMIT and EMIM drivers, The Black Widow tonearm, and many other truly memorable products. However, their fortunes changed in the late seventies, like those of many other famous but small companies, and for many years now, infinity has been a sister company to JBL, and both are under the umbrella of Harman International. Despite their somewhat pompous name, models from the Reference series are in fact their entry level models. In its original form, this speaker was reviewed by our Editor-in-Chief Lucio, and we conferred somewhat whether to publish this text. However, we felt that these popular speakers deserved another shot in their Mk.2 guise, now named Reference 11i (where "i" presumably stands for "improved"). It's still a smallish box, measuring 27x39x23 cm (app. 10.6x15.4x9.1 inches, DxHxW), which gives a gross volume of some 24.2 liters, or approximately about 14 liters of effective volume, assuming 19 mm wall thickness. It's a bass reflex system, with a generous vent on the back. Also on the back, you'll find two binding posts, of very commercial, but still decent quality, capable of accepting 5 mm cables - a nice touch. On the front, you'll find a 15 cm (5.25") mid/bass driver and a 25 mm dome tweeter. The bass is a classic Son Audax driver, probably model AP130M0 or some such, and the tweeter is not directly comparable to the Audax catalogue - probably a custom made unit. Nominal impedance is 6 Ohms, nominal sensitivity is 89 dB/1W/1m, response is claimed to be 65-20,000 Hz +/- 3 dB, and power handling is said to be 75W. The crossover is said to be at 2.8 kHz. Finish is in typical black vinyl, approximating (I think) cherry; actually, it's rather good, better than is customary at this low, low price point. Front edges have been rounded off, as current practice dictates, and the grill is removable. This is rather good, because I would take it off and never put it on again, the speaker is much better off without it, especially in terms of space and 3D rendition. As most Harman International speaker products, these have also been put together in Denmark, where their entire European loudspeaker manufacture seems to be located. Net weight is just short of 7 kilos per speaker, so in transport, they do save quite a bit of money, all the more so since the driver factory, Audax, is located in France, so the entire process is completed within the EC. Speaking of which, the speakers do have a CE certificate, as all Harman products do. A final point - note the serial numbers. They clearly show Infinity made no attempt to use any form of pairing, something I am not keen on seeing, low price notwithstanding. The usual procedure calls for trying the speakers out at rather low levels, from just above whisper to quiet speech level. This is done to ascertain how well the speakers carry or do not carry the tune, all of it or part of it, at low levels. I'm pleased to report that Reference 11i are among those speakers which do carry the tune at low levels - well, most of it, anyway. At low levels, all speakers subjectively have weaker bass - so it is with 11i as well, and its small effective volume and main driver surely do not help here. However, when compared with similar speakers, they are still among the better of the group, though they cannot compare to, for example, B&W DM602, which is something of an oddity anyway (since it behaves as if it costs twice its price all around). Small volume cuts out deep bass in any event. Its midrange is, on the other hand, a bit special. It's very clear and coherent, with little detail loss and good integration of what there is of bass. I would say the leading edges are better than the falling edges, but this is very typical of cheap speakers and cheap electronics, and in all honesty, 11i does considerably better in this department than most of its competitors and quite a few of its peers. The treble, on the other hand, appears to be a little recessed, a bit more subdued than I would like it to be. You hear it, it's there, cymbal crashes will certainly not pass unnoticed, but somehow I feel it should be a bit more prominent, perhaps a little more pushed forward. Please note that this is a very subjective view. When pushed harder, all the way to really hard, these speakers change their character rather a lot. For a start, the subjective feeling of a slightly recessed treble disappears completely, as the whole becomes much more in-yer-face in overall character. Not obtrusive, but more explicit and a little more brash. There is still no deep bass to speak of, the bottom two and a half octaves are veritably missing, but even for my deep love of deep bass, I do not hold it against these speakers, rather I'm pleasantly surprised by their attitude. I always prefer the road Infinity took to any other option; what they did was simply shrug and say that it can't handle deep bass, so let's not waste time trying for the impossible. In other words, it's missing the deep bass, but doing so gracefully, without false hopes and vain try-outs for the unattainable. It has what it has and does not even try to pretend that it has something it does not - the honest and very rational approach. The mid range doesn't change much, if at all, it simply becomes louder. But the treble does change, and in my view, not for the better. It tends to be a little shrill at times, however, not by itself, rather it seems very unforgiving towards the program material you feed the speakers. With good recordings, it's just a little more prominent now, quite the opposite to what it was with low levels, but is by no means obtrusive or brash. However, if the program material is not of the best quality, or if you should have a bright sounding system, you may well find it leaning towards the fizz and sheen brigade. On a few occasions, it almost cut my eardrums, albeit with rather poorly done recordings, made by what must have been stone deaf producers - and using my generally soft and warm Yamaha CDX-993 CD player, now heavily tweaked. Let's not forget that these are entry level speakers, with a truly low, low price attached. Because of this, I tried them out in as many variants and systems as I could, and because of the extremely democratic environment of my home, where everybody has their own room and their own audio system, the number of variations was not small. In purest form, driven by my Karan Acoustics KA-i180 integrated, with signal from the modified Yamaha CDX-993 via Van den Hul interconnects and speaker cables, Reference 11i acquitted themselves well for such cheap speakers. To be sure, they had faults a-plenty, but please note the gross mismatch in prices - for the price of the system driving them, you could buy no less than 12 pairs of these speakers, and at local prices (where all listed items cost less than elsewhere). In relative terms, I must say they stood up and were counted among the better examples in their price range. In system 2, signal coming from Harman/Kardon HD730 CD player on SoundCare spikes, Harman/Kardon HK 680 integrated amplifier and Van den Hul cabling all around, with HK 680's somewhat softer sound, they played better music. The overall impression was one of greater smoothness, with perhaps just a small detail loss. In system 3, signal from a modified Philips CD721 CD player, a Harman/Kardon 6550 integrated amp and (yet again!) Van den Hul cabling, the system sound was almost the same as in System 2, and the fact that there was a difference in available power output (down from 85 to 50 WPC into 8 Ohms) was not obvious at any time. However, since the 6550 uses a single ended push-pull (SEPP) power section, there was a slight added naturalness about the sound. Ultimately, this was the best sounding setup in the group, with the obvious benefits of switching the Philips for the Yamaha CD, such as much more detail, ambience and dimensionality. 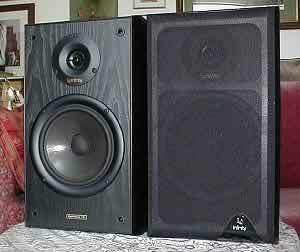 This same System 3 uses JBL's CM62 speakers, which locally cost about 25% more than the Reference 11i. This obviously invited much comparison, as this was the more natural system they would find themselves in. The CM62 came out as the more vivacious of the two, but Reference 11i was definitely better on ambience. My last set of experiments was centered around pairing the Reference 11i with my JBL Sub 10 active subwoofer. They can be used in two modes - in parallel, where the sub simply augments the main speakers, or as a system where the sub is used to filter and reproduce low frequencies, and the Reference 11i were fed this filtered signal, with frequencies below 100 Hz removed from the signal and sent to the sub. To cut a long story short, the second system arrangement was felt to be the better of the two. It allowed for the reproduction of very low, very powerful and vibrant notes, which drove the music well, but another very important aspect was that the 11i were freed from stress and strain below 100 Hz, which helped clear their own higher bass and midrange. This allowed them to work with almost no compression at all, and the sound stage got a little wider and better defined. In other words, it's the ambience factor which profited the most from this, and deep bass notes only helped here. So, all in all, these are pretty decent small loudspeakers, with a typical witch's brew of strong and weak points, resolving which is no easy task. I think they are intended to be your starter system, something to use while you recuperate from your initial purchase, something to listen to and not be sorry you bought them. But I also think they will shine with an active subwoofer uses in system mode - that will allow them to really shine as best they can (and it's no small deal, either), let you hear the deep bass you need for fidelity and perhaps save some money on amp power, since you will probably have an active sub. All by themselves, these are decent speakers in absolute terms, which rises to very good when you take their truly modest price into account. For the money, I sincerely doubt you could do better anywhere except locally, in Yugoslavia, where for the same amount you could buy B&M Acoustics AP17 - but only here, everywhere else these would cost more due to shipping and customs. Different to be sure, but better? I don't think so. Sure, I still much prefer B&W DM602, but locally, it costs almost double the price, and is thus no real comparison mate. 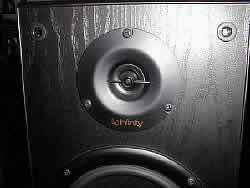 One last point - Infinity Reference 11i are a little more sensitive to speaker cables than usual. Exactly why we can only speculate, but it is so. To give what they have, and they do have quite a bit, they could use decent cables, as usual, the better the cables, the better the effects. Use standard litz copper and you won't get too much out of them, but move on up just a bit, to say Van den Hul CS122 or similar, and you're home and dry. 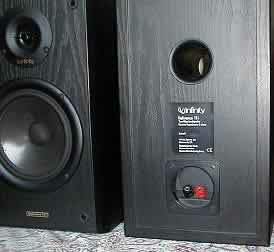 So, all in all, a creditable performance from these really conveniently priced speakers. Their only real trouble spot is that you'll soon start wondering what would Infinity have given you for twice, let alone three times their price - and a good question it is.